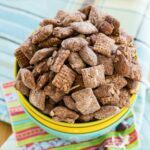 This puppy chow recipe adds the flavors you love in an Almond Joy candy bar to a classic muddy buddies recipe. This almond butter puppy chow is peanut-free and gluten-free, with a vegan option! In a food processor or Magic Bullet, combine the powdered sugar and coconut, and chop until the mixture is mostly a powder. Combine the Chex and almonds in a large bowl, and set aside. Combine the chocolate chips, almond butter, and coconut oil in a medium bowl and microwave on High for 1 minute (or melt on the stove over low heat, preferably in a double boiler). Stir until completely melted, then stir in the vanilla extract. Dump the mixture into the bag with the sugar and coconut, seal,and toss until the cereal and almonds are evenly coated. *If you don't have coconut oil, you can use butter, and maybe a little coconut extract for that additional coconut flavor.